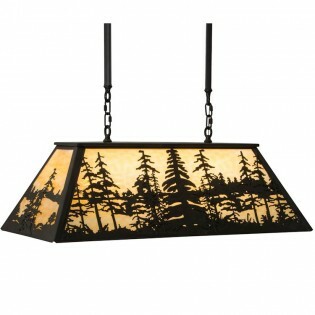 A nature inspired design of Tall Pine trees is depicted on the Midnight Forest Island Light. Soft ambient light is diffused beautifully through stunning Beige art glass, which is complemented with Timeless Bronze finished decorative accents, frame and hardware. Ideal for illuminating billiard and dining tables, islands, counters and bars.